If you are staying on the islands it is likely you will want to vist the other islands and each island has a boat service linking it with the other islands. Generally St Mary's is where most visitors to the Isles of Scilly stay although many choose to stay on the other islands (generally referred to as the Off Islands). In all cases there is no scheduled service as such (there is no published timetable) rather the services that will be operating each day are placed on chalk boards at the relevant quays and information centres. Services therefore vary from day-to-day. From St Mary's the St Mary's Boatmen's Association run the principal boat services to the other islands. The services operating each day are normally put on the chalk boards around 8:45am each day and the boards are located on the quay at Hugh Town and also at the Isles of Scilly Steamshop office and information centre in the centre of the town. The services offered each day tend to depend on the season and weather conditions. Generally during the summer you can expect a service to operate at least once each day to Tresco, Bryher, St Martin's and St Agnes normally departing at 10:00am or 10:15am and returning somewhere between 2pm and 2:30pm or at 3:45pm or 4:45pm. The chalk board will give times and the boat used and the boats generally line up on the quay around 30 minutes before departure - you might have to walk accross the other boats to get to the one you want since they often line up side-by-side. During the summer you normally get extra boats to the larger islands, especially Tresco with later morning and afternoon depatures too. There is also often an evening trip to St Agnes in the summer. When getting the boat out the boatmen will give you the return time(s) and also tell you where they are depearting since in many cases the islands have different quays and jetties and you may have to return from a different one from where you arrived due to the tides. Trips to the uninhabited island of Samson are also possible but these don't run everyday and may not run for several days in a row. Direct trips to the other islands cost £8 return. As well as the above trips there are usually other trips offered and in many cases these will also land on one of the other islands on the way back allowing you the chance to combine a boat trip with a vist to one of the islands. The following is a list of the typical trips on offer, but don't expect all of these to run each day as they are dependent on the weather, especially the trip to Bishop Rock lighthouse which requires very calm conditions. 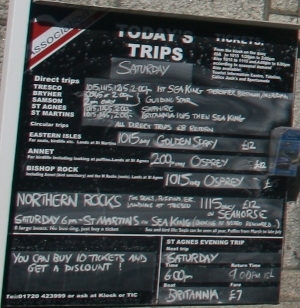 The cost for these trips is normally £12 except for the Bishop Rock trip which costs £15. Seabird Special - a bird watching special. The Round Island Lighthouse - a trip to Round Island and it's lighthouse and the uninhabited islands of St Helen's and Tean. Around St Mary's - a trip around the coast of St Mary's. In addition some smaller independant boats operate from St Mary's. These often run bird watching trips of the chance to visit multiple islands in one day (often 2 or 3) as well as the chance to land on some of the uninhabited islands such as St Helens and Tean. The list below is some of the boats and operators but these trips are also normally put on chalk boards at St Mary's quay. Bryher Consult boards - the boats often link these two islands. Circular trips (bird watching etc), often landing on other islands Sunday, Tuesday and Thursday. St Martins Boat Services normally serve St Mary's, Tresco, St Agnes and Bryher with trips leaving from the higher town quay at 10:00 and lower town quay at 10:15. Consult the chalk boards by the shop and at the quays for details or call 01720 422814.